Take a vacation to a tropical paradise called Sweet Hawaii where the sun is always shinning, the water is always warm and there is plenty of cash to be won! Click here to play! As you experience all of the wonders that the Hawaiian Islands have to offer, be sure to see a Hula show. Spin two to five Hula girls to bring in a massive win of up to 5000 times your line bet. She will also trigger a bonus feature if you're lucky enough to spin her anywhere on reel 3. You'll want to see the surfers conquer the monster waves. Two to five of these brave dudes will get up to 1500 times your line bet. You'll come across quite a few other Hawaiian symbols as you roam this island, including boats, Lion Fish, coconut drinks, flowers, hats, shirts and leis. All of these will help you bring in your Hawaiian fortune. No trip to Sweet Hawaii would be complete without witnessing the glory of the active volcanoes. Not only will this explosive wonder treat you to a magnificent show, but it will also multiply your total bet and trigger a bonus feature that could see you taking in plenty of big wins! 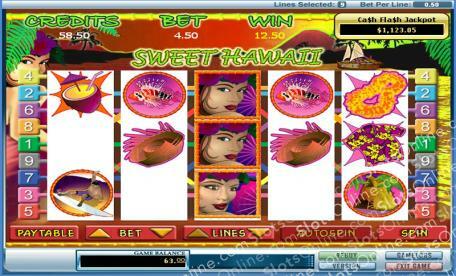 Take a trip to the Hawaiian Islands for fun in the sun and a chance to win plenty of cash. There are a couple of different scatters in this game: the volcano and the Hula girl. Spin two to five of the volcano anywhere on the board to multiply your total bet up to 150 times. Three or more of this symbol will trigger a bonus feature. If you can spin the Hula girl anywhere on reel three, you will trigger the Hot Hula feature in which all symbols on the triggering reel will chance to the Hula girl and she will substitute for all other symbols. Prizes are paid according to the Hot Hula paytable. Spin three or more volcanos anywhere on the board to trigger the Cash Eruption bonus feature. During this feature you will have to choose one of five volcanos to reveal a number of free spins. You will then choose a second volcano to reveal a bonus symbol. If this symbol appears during your free spins, you will get up to 100 times your triggering bet. All prizes are doubled during the free spins.